Hindsight bias occurs when we look back on past events. In particular, when we analyze past events, we tend to use more information than was actually available at that time. As such, we often fail to realize that a lot of the information available today was not available back then. As a consequence, this causes us to think that the past is more predictable than it actually is. We suffer from hindsight bias every day. When it comes to the field of investing, most investors will have experienced trades that performed badly. Afterwards, we can find a lot of reasons why we should have waited longer before buying or selling a particular security. However, in the vast majority of the cases new information that was only available after we executed the trade, caused us to change opinion about the trade. Therefore, we should take away from this that the appropriateness of trading decisions made in the past, can only be judged using information available back then. Hindsight bias makes the past look more predictable than it actually was. At the same time, the fact that past events look predictable, also deludes us into thinking that future events are more predictable than they really are. 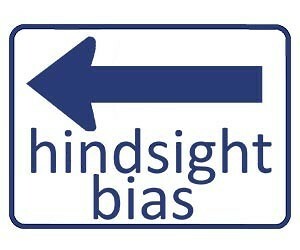 This way, hindsight bias has the tendency to make investors overconfident. This in turn causes them to take more risks and trade more than they otherwise would. Hindsight bias makes the past look more predictable than it really was. For finance, it means that investors should never judge the quality of trades using all information available today. Instead, we should wonder whether a trade was a good decision, in light of the information that was available back then.